is 'responsible lending' starting to mean investing in private businesses more, and social enterprises less..? Since what seems like forever, there has always been the provision of 'alternative finance' - people and communities coming together to support each other financially when either the banks said "no", or because they wanted better terms than mainstream lenders were offering them. Over time, this has led to the creation of what's now named and recognised as 'alternative finance' - pioneered by early co-ops, community businesses, and charities through things like credit unions, the formation of the Charity Bank, and such like. And then attracting global interest through the rise and populism of 'micro finance'. But this isn't a post about the history of this sector (although there are some good stories to tell - like what happens if Quakers set up a bank to offer a more ethical alternative in the 17th century, only to have it suffer 'mission drift': we know it as Barclays bank today. And what happens when all the studies and research starts to show that micro finance doesn't deliver on its promises to lift people of of poverty?). Instead, this is about my wondering if the recent performance of alternative finance providers, as reported by the sector body, Responsible Finance, is showing that social enterprises are increasingly moving away from such ethical alternatives, and that we're seeing private businesses making better use of these lenders designed to step in when mainstream banks and lenders said 'no'. 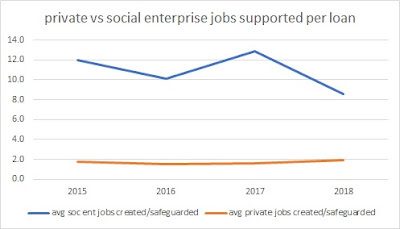 And in doing so, are we also starting to see an evidence base emerging that shows private businesses are better at creating social impact than social enterprises...? As readers of previous posts like this may recall, I don't claim to use any statistically significant variance analyses - I try and take a simple layman's approach: looking at the data as it's been published, and sticking it into some simple charts. To do this, I've drawn on 4 years of annual reports published by Responsible Finance, and also one of Social Enterprise UK's 'state of the sector' mapping reports too. Now I mentioned having also looked at another data source - Social Enterprise UK's mapping of the sector. In 2017 this reported that nearly 1 in 4 of all social enterprises were actively seeking to take on a loan of some type (with 83% who applied to do so, receiving an investment = approximately 14,000 enterprises), and those that did were able to secure a median amount of £60,000. But against the comparable year from the responsible lenders, the average amount was £391,185, against 363 borrowers. 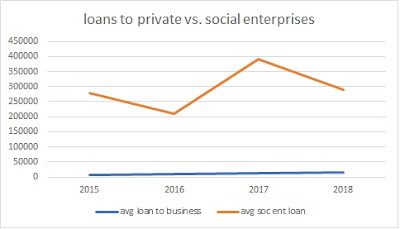 Which suggests that most social enterprises are NOT going to alternative and social lenders to raise investment, and those that are, are far larger than the typical social enterprise is. All of which seems to paint a picture of responsible/alternative finance being a good thing if you're a small private business looking to start up. And for these lenders themselves, private businesses would also seem to offer a more stable client base to build on in the future too. 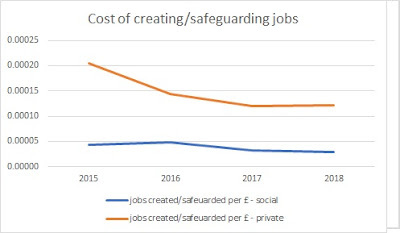 These private businesses would also be good to show to policy makers to boot, with their offering better apparent value in helping to create and protect jobs in the wider economy. All of which makes me wonder if alternative finance has gotten too good at being 'alternative' - in evidencing to the wider marketplace of mainstream lenders and high street banks, that those enterprises and people who they previously said "no" to, can now be said "yes" to? But this is a layman's take on annual reports published by industry bodies. As with my previous posts like this, my hope is that rather than start a revolution and change the system completely, is will instead provoke some further reflections and conversations, and help contribute to making sure that the support and services we offer to businesses (be they private or social), can remain most relevant and current in meeting their changing needs, and by association, the people they employ and the communities they serve. All I've done here is what I don't see happening that often amongst policy makers and sector bodies - looking at trends over time, and starting to cross-reference other data sources to try and better understand the picture.